Maybelline has a nest of lambs! Lambing season 2014 finished up in a really good way on Saturday evening, Easter eve. My sweet Maybelline gifted us with a beautiful set of triplets, two white ewe lambs and a black and silver ram lamb. Often times with triplets, it's a bit challenging for them to be born in the proper presentation (as if they are diving - head down between two front feet). You can only imagine with 3 heads and 12 feet trying to make their way into the world, things might get somewhat confusing! 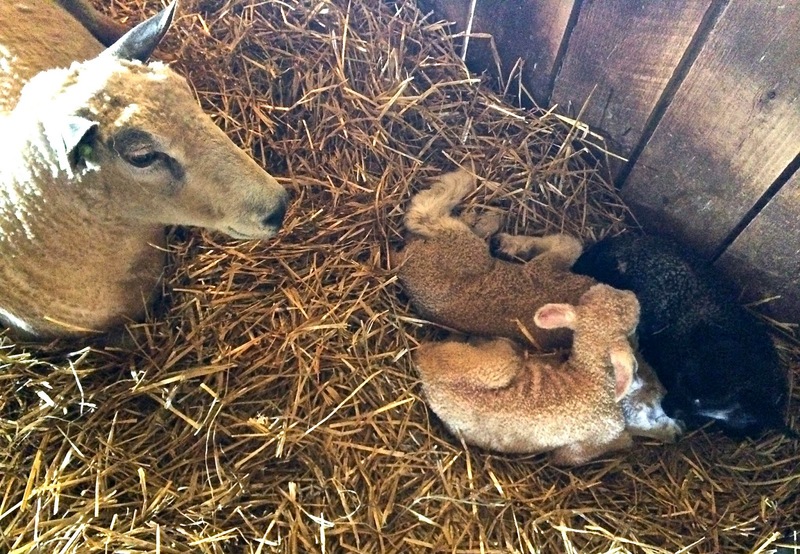 Maybelline's triplets were all perfectly positioned and the birthing process went very smoothly. Out of the 13 ewes we bred this year, 5 of them had triplets and some of those births were much more complicated. Because of my own health issues, it has been trying at times, but all in all, I would consider it a successful lambing season. Not quite the garden of my dreams - it will look better in a month or so! It's finally warming up here. The grass is green (and in need of mowing already), the trees are leafing out and I'm entertaining thoughts of gardening. The garden is rather forlorn looking right now, but give me a little time and it will be lush. Right now I'm waiting for the first spears of asparagus to appear and soon after that, strawberries. Traditionally in Kentucky, planting out isn't safe until after Derby day, but given the weather we've had so far this year, it may be better to wait a week or two longer. I've decided to expand my dye plants this year and maybe (radical thought) not put out quite so many tomatoes. What I love most about the garden is being able to stroll through before dinner and pick my salad ingredients or maybe just a pluck a few tomatoes and call bacon and tomato sandwiches the meal! What I'm slowly coming to admit is that I don't always enjoy having mounds of produce on the counter waiting for me to freeze, can, pickle or make it into jam. Sometimes it's good and sometimes it just feels like too much pressure. I still have enough bread and butter pickles to supply us for quite a while, thank you very much! These warm sunny days find me not sure where to start. There is so much to do. It's the time of year when I'm typically feeling quite overwhelmed by the sheer size of what we try to maintain. I've been through it many times before and I'll calm down soon! I hope everyone has checked out all the sweet pictures of my lambs that Sara has taken recently. Sara is a gifted photographer and I'm so pleased that my lambs get to be part of her yearly Lamb Camp. I'm so happy to hear that you're on the road to recovery!! Thank goodness you found a doctor who coulkd give you thecare you needed. Yes, indeedy do!! Maybelline is my girl too fleeces or NFLs-- all 9 lbs of her fleece from last year. It's been processed and she is next in the queue to be dyed/spun. Such lush fiber. Hug her and the babies for me. Are there any black fleeces or BFLs laying around? Oh Elaine, I do thank you for your patience! I am finally at the point where I can start in on skirting fleeces and I hope to send you some samples within the next week. Maybelline is one of my favorite ewes, both in temperament and fleece type and I'm very happy to now have two of her daughters. Please take your time, Dianne, with the skirting and samples. I'm definitely not in a hurry. The Lamb Camp photos are just the cutest. Just rest up and dream of green grass. Don't take on more than you can handle. Think of your health first. Hi Dianne...I have so enjoyed watching the Lamb Cam this year. The little lambs are so sweet when they are young and rambunctious! It is pretty hilarious when they vie for the top of the hay bale. I am so glad to hear that you are finding some help with your health issues. I had Lyme disease for three years before they diagnosed me, and I have good days and not so good days. Since I am an artist, I try to use the not-so-good days for more quiet painting and drawing time. Sometimes we just have to slow down and go with the flow....and be grateful. Thank you for sharing your little piece of heaven on earth with all of us. It is such fun to keep up with your farming life! Blessings!!! There could be a whole calendar of just your pretty lambs!